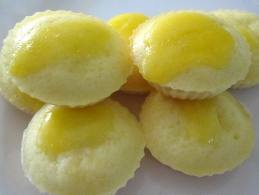 “Puto” is a kind of steamed rice cake in the Philippine cuisine. It is usually eaten as a merienda – a light meal or snack especially in the afternoon, but can also be eaten for breakfast with coffee or hot chocolate but it is best served with “Dinuguan” (Pork blood stew) as a hefty afternoon merienda. Filipinos, known be creative when it comes to cooking, tried to make this puto recipe more delicious and more nutritious. It was the reason why Puto now has a lot of variations thus having no specific place of origin. It varies from different flavors, shapes and sizes. It is the same reason they came up to the idea of making a cheese-flavored puto or Puto cheese. Putocheese is made from rice flour or galapong which means that is rich in carbohydrates and will be a good substitute to rice meals, if you are on, you know, diet. Cheese on the other hand is a good source of protein since it came from milk. Here on the Philippines the best served puto cheese can be found on Biñan, Laguna. Puto Biñan is composed of grinded rice, lots of eggs, mixed with waterand after that it is pampered with cheese. So as you see, Puto cheese can really be great replacement for heavy rice meals and it is also a good merienda. So if ever you plan on reducing or minimizing you heavy rice intake, try this recipe! Sift the rice flour, salt, baking powder and white sugar together. In a large bowl, add the coconut milk to the sifted ingredients and blend until the mixture is smooth. Slice the cheddar cheese into thin rectangles. Carefully pour the mixture into the muffin pans (greased with butter beforehand), making sure you leave 1/3 space at the top. This is to give the puto space to expand upon cooking, then place the sliced cheese on top of each puto mixture. Steam for about 20 to 30 minutes. To check if the Puto is already cooked, insert a toothpick into the center of each puto, make that the toothpick must come out clean.